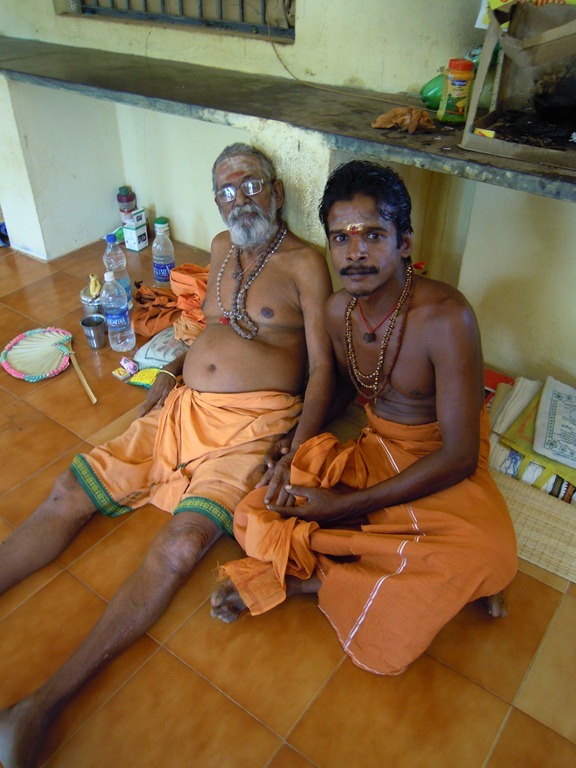 Sadhus give their lives to God. Renouncing family, home, and possessions, they live only on what is given to them. 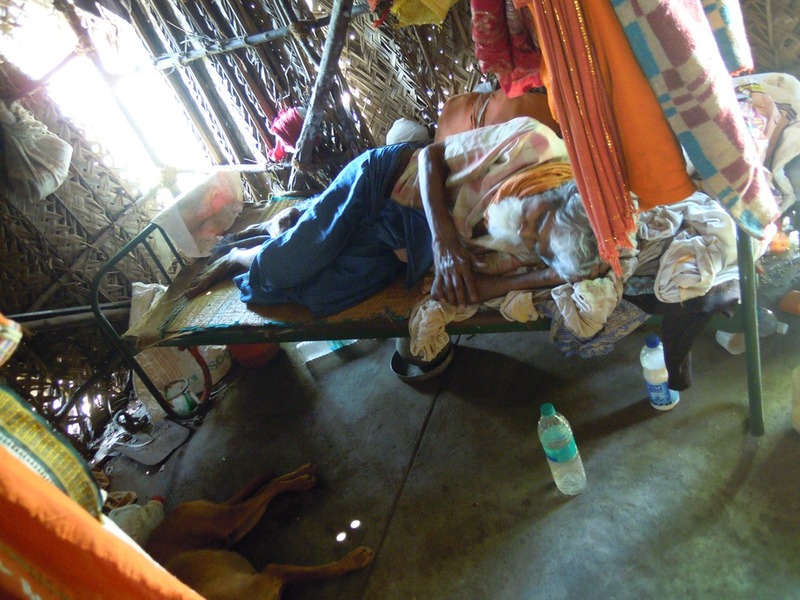 When they are healthy, this life has many hardships; when they are old, infirm, and disabled, it is nearly impossible. 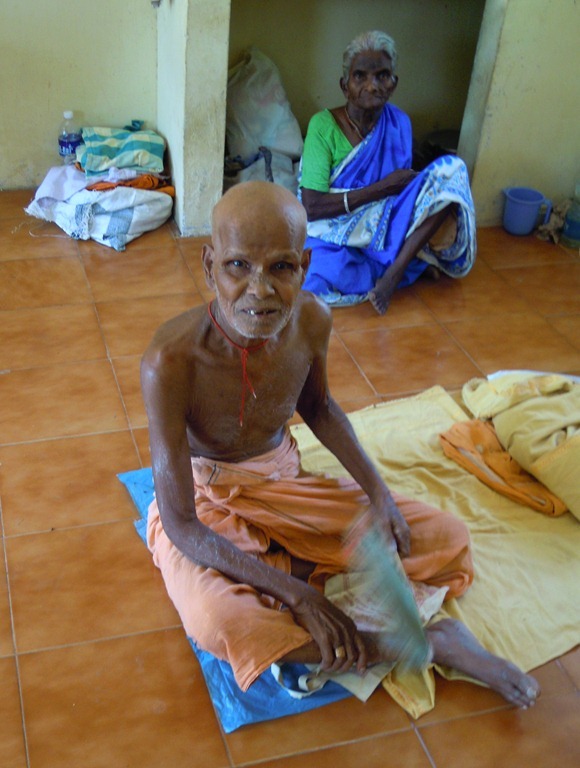 A few months ago we were shown a group of sadhus who were old and disabled. Many are blind. 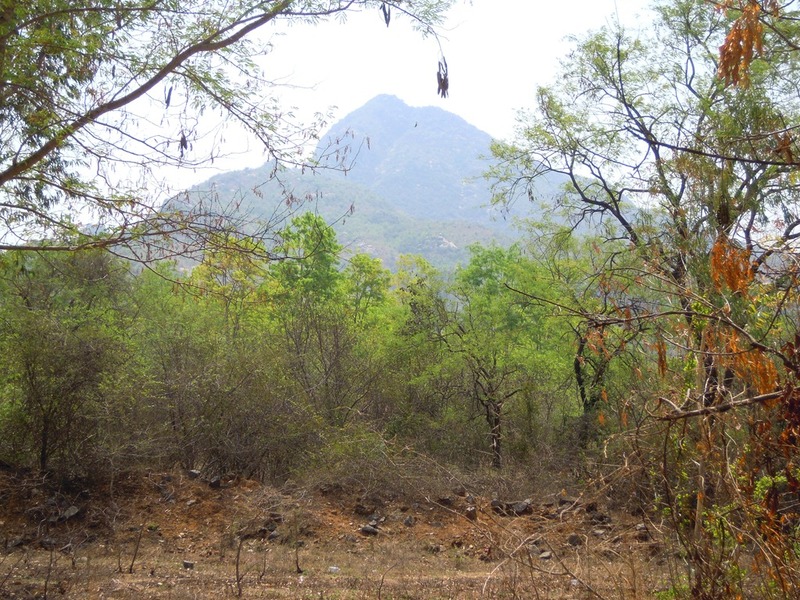 Some live in a government-built shelter originally intended as a resting place for those walking Pradakshina around Arunachala. Others stay in a house made of palm-leaf thatch behind the government building. It is easy to miss these sadhus when walking or driving past this point, since they mostly are unable to come out and be seen. 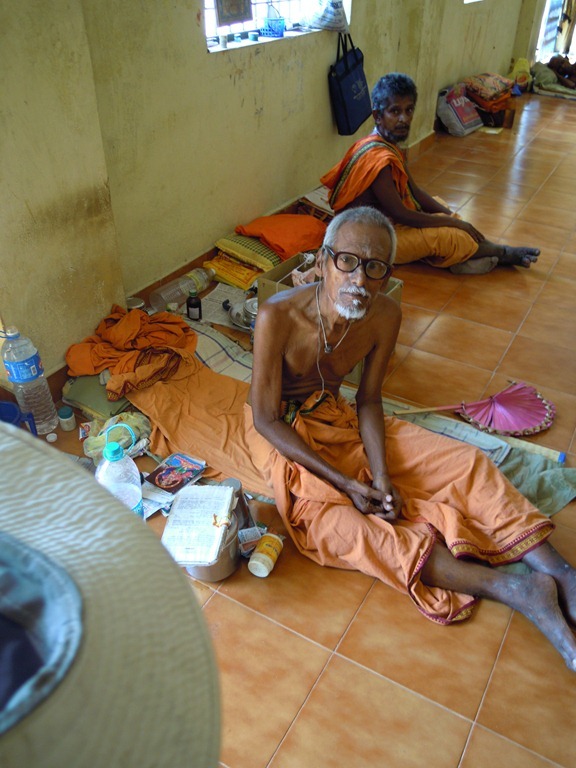 When I found out about these sadhus, I told our friends at Quality of Life Trust, who are already helping aged homeless elders in a nearby village adjacent to Tiruvannamalai. When I told Dhakshinamoorthy, who runs the Trust, he immediately wanted to help, even through he has no funds for this. 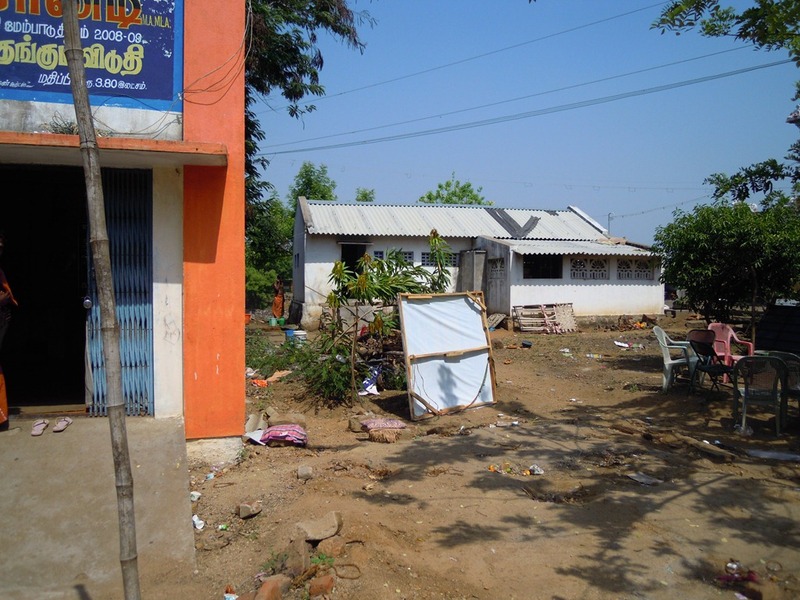 He investigated and found out that there are 20 sadhus housed in these two buildings. They have only sporadic food, and little if any medical help. He was also told, when he investigated, that if he is able to start providing food, that it is vital that this help keep going. They have had some attempts to help before that started then stopped, and this was very bad for the old sadhus. 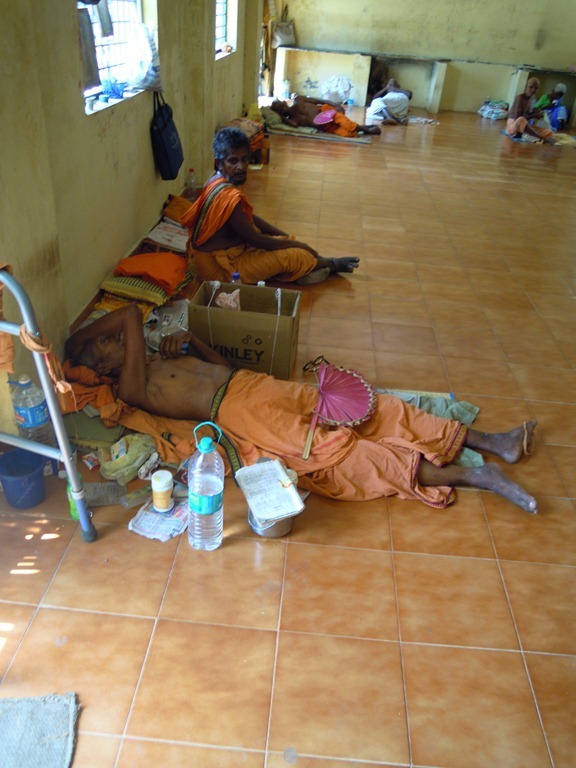 Starting in May 2012, with an emergency donation, the Quality of Life Trust started daily feeding of these sadhus. 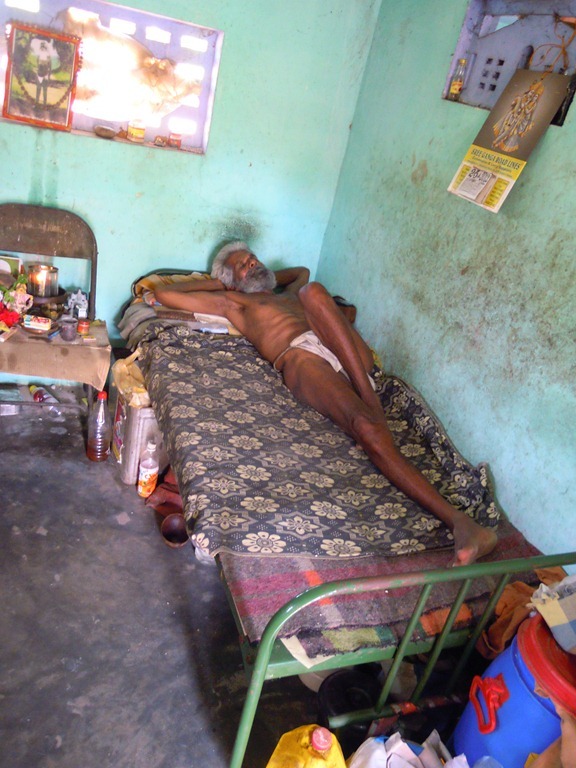 This post shows these sadhus and their living situation. Here is the government building, on Pradakshina Road, about 2 km from Bangalore Road. 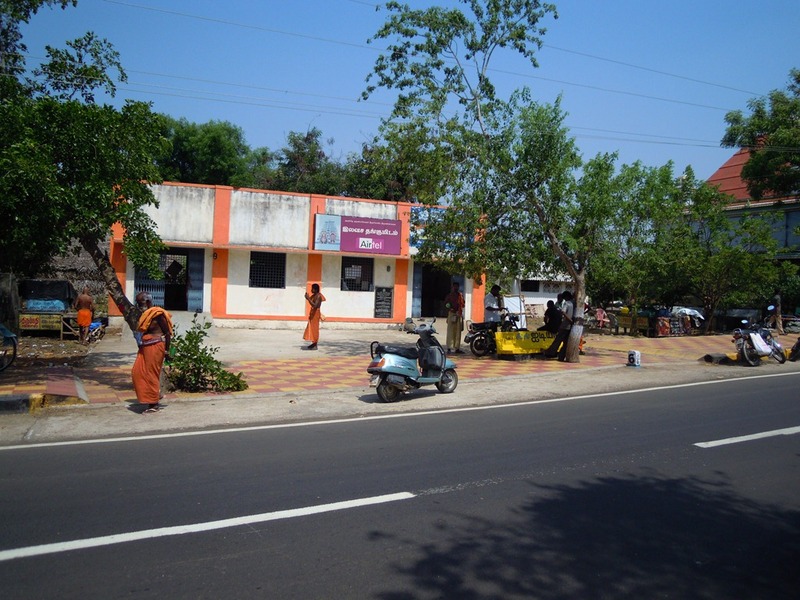 It is next to a popular temple, visited by many who come here. 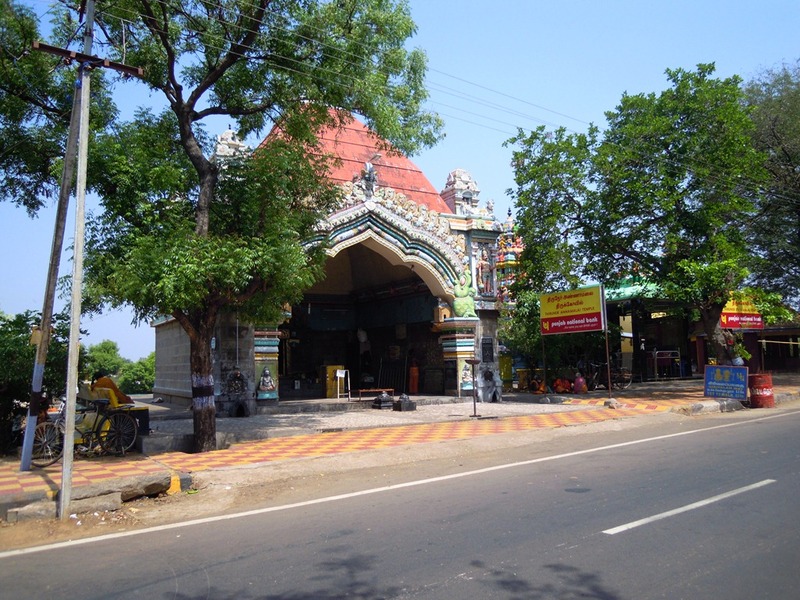 It contains a famous lingam, called Edirner Annamalai. Between the two buildings is an area that can be walked through, and another small building set back from the road. Face to the left after walking past the government building and you see a thatched hut. Standing in front are Dhakshinamoorthy and the young man who will be bringing the food here each day. 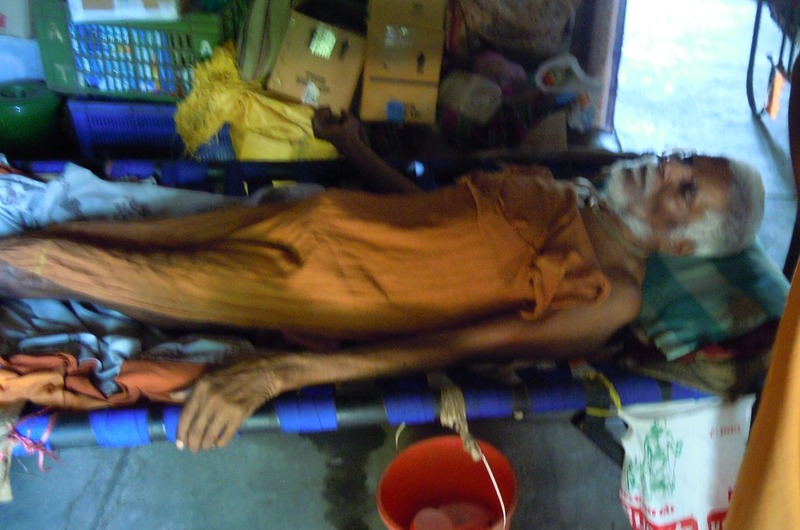 The man sitting on the cot closest to Dhakshinamoorthy is Ramesh, who assists in the running of Quality of Life Trust. They wanted to make sure that I saw the roof. The only thing that keeps water out is a big piece of plastic, and even it leaks. In a few weeks, in June, the monsoon rains start. They badly need a new roof. We walked inside a saw a few of the old sadhus who now live here. This man is not able to sit up. 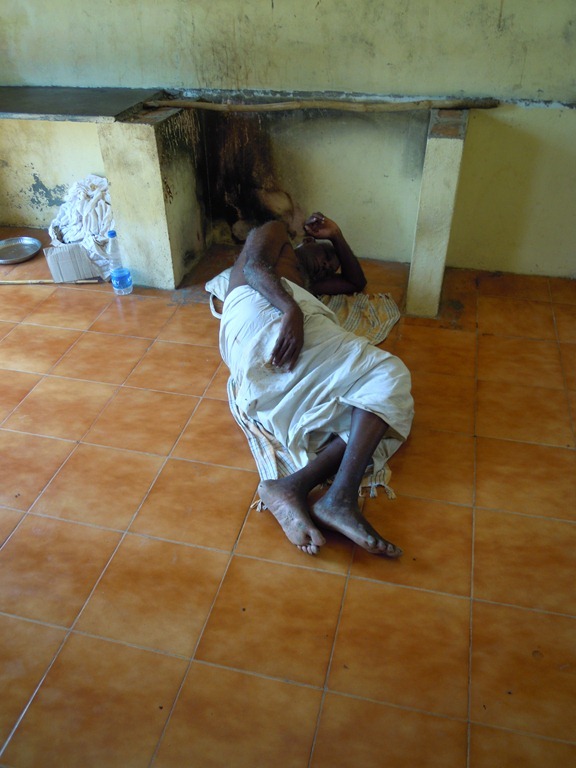 A barrier has been set up here to keep this sadhu from getting out of bed. Besides severe physical problems, I think he also has mental problems that often come with age. 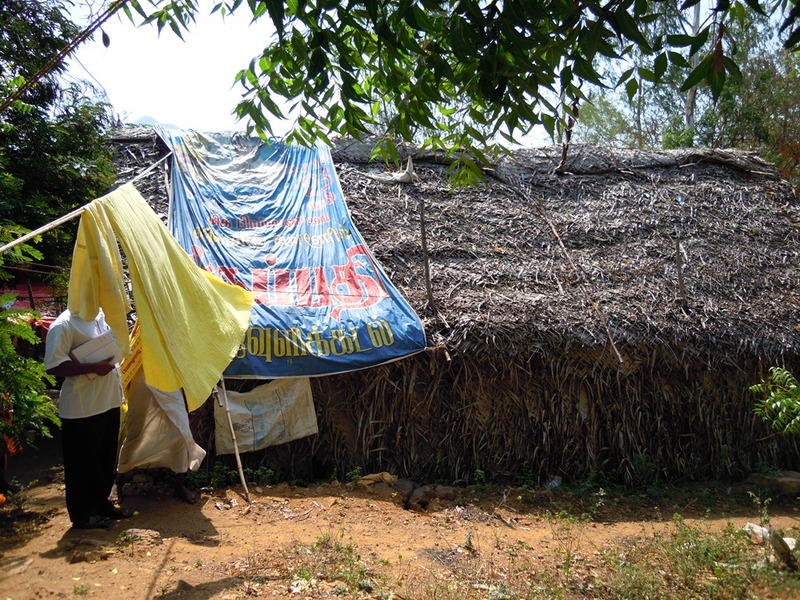 Before this hut was built, he just lived on the street (as was the case for most of the sadhus here). 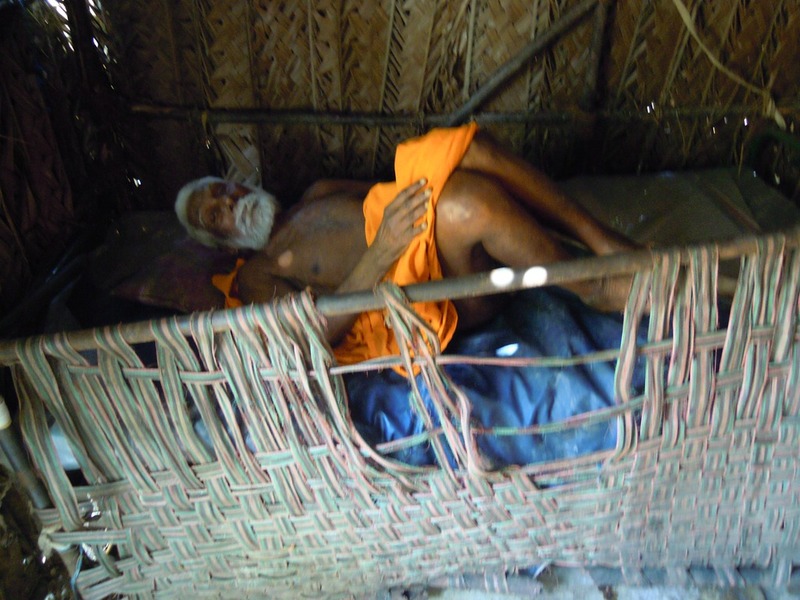 Another sadhu lies in bed. From the emaciated look of his body, regular feedings will help him. Another sadhu who cannot sit up. This sadhu sits behind the building. Compared to the others, he is doing pretty well. He is blind, but he can sit up and move around some. He is alert. His arms and legs are very thin, though. This man stays in the small building back from the road. They struggle to find spaces for everyone who needs it. Next we went into the government building. There were another six or eight sadhus here when we visited. This man is mostly blind. He just slept. They had brought food here a little earlier this morning, so he is sleeping after eating a good meal. This old sadhu sits here. He has lost most of his teeth. He seems alert. An old woman sits behind him. I do not know if she is a sister, or what? Another one lies on the hard floor, without even a mat underneath him. . This sadhu shows good awareness and response to us. Even with hardships, I feel a presence of peace coming from him. This younger sadhu made it a point to join this old one, to sit with him and hold his hand while the photo was being taken. Outside, Dhakshinamoorthy talks with one of the healthy sadhus who stays near here. He has taken it upon himself to try to help these old sadhus, even though he has nothing himself. There is another sadhu who helps, too. 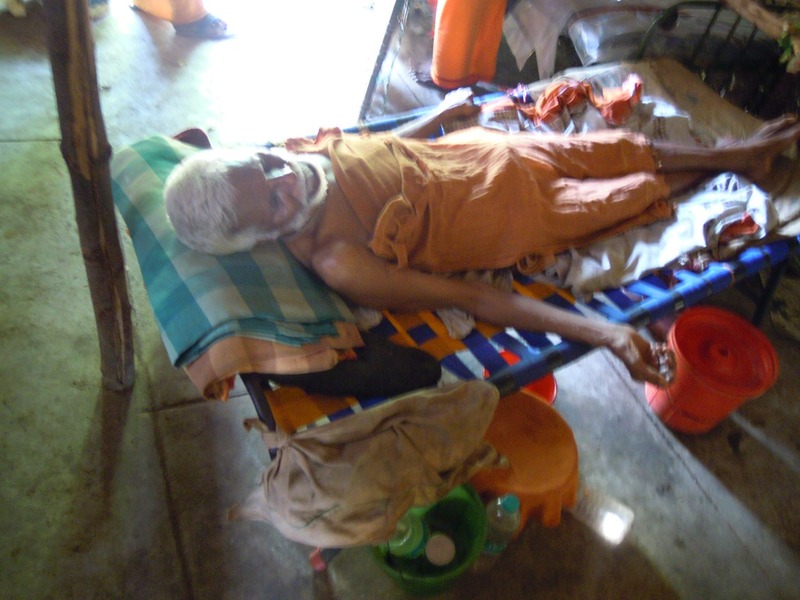 He is not here today, because he has taken one of the old sadhus to a nearby hospital for emergency treatments. 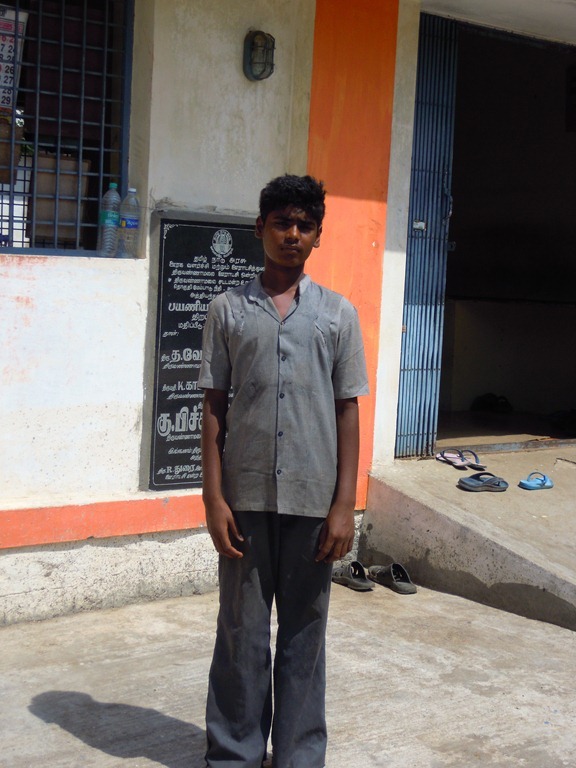 Here is the ‘boy’ (young man) who will be bringing the food each day. He is without a mother and a father, and the small amount he is paid for this work makes it possible for him to eat each day. Across from the sadhus is Arunachala, giving His grace upon all who can open their hearts to Him. More help is urgently needed, and not just help today, but ongoing long-term support. 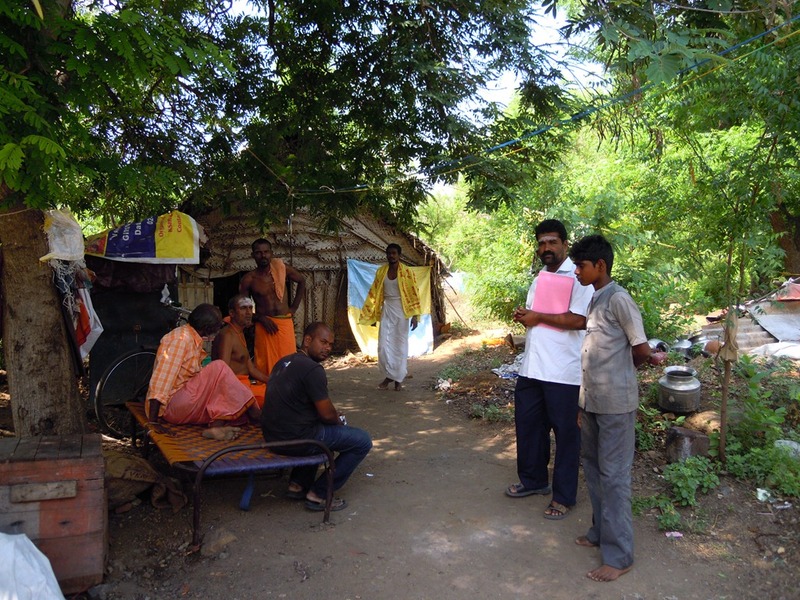 We have taken on helping these sadhus because there is no one else willing to step in. Help, in the form of donations, is needed. 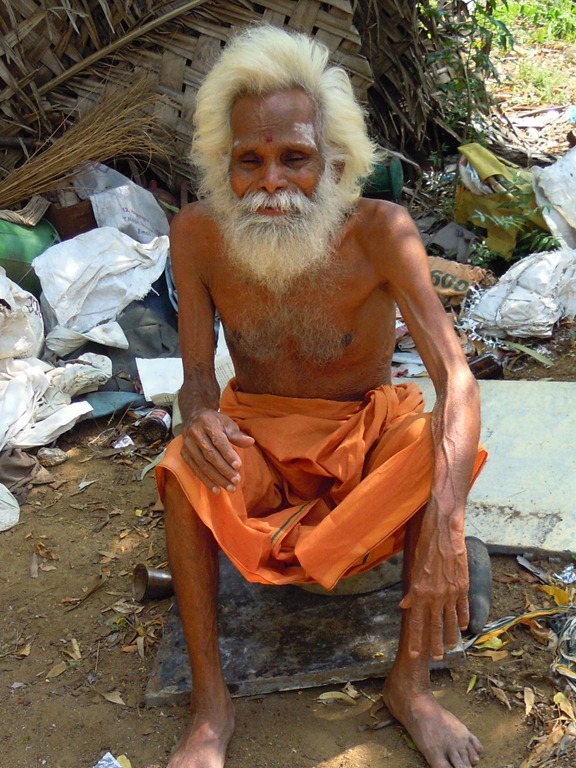 $200, or Rs 10,000, provides one meal each day for a month for all 20 sadhus. It would be great if we could provide at least two meals each day. There is only money now, even with the emergency donation we received, for one meal each day. Medical care is needed. It is impossible to know what this will entail, but $200, or Rs 10,000 each month, would probably go a long way towards meeting these care costs. A new roof is needed urgently. Probably this would cost $500, or Rs 25,000. If you are moved by this situation in which these men, who have given everything to God, now find themselves, and can find a way to help, please let me know. Send an email to richard@infinitepie.net and I will let you know how you can donate. What is especially needed are one-time funds for the roof, and ongoing donations for the feeding and medical care. 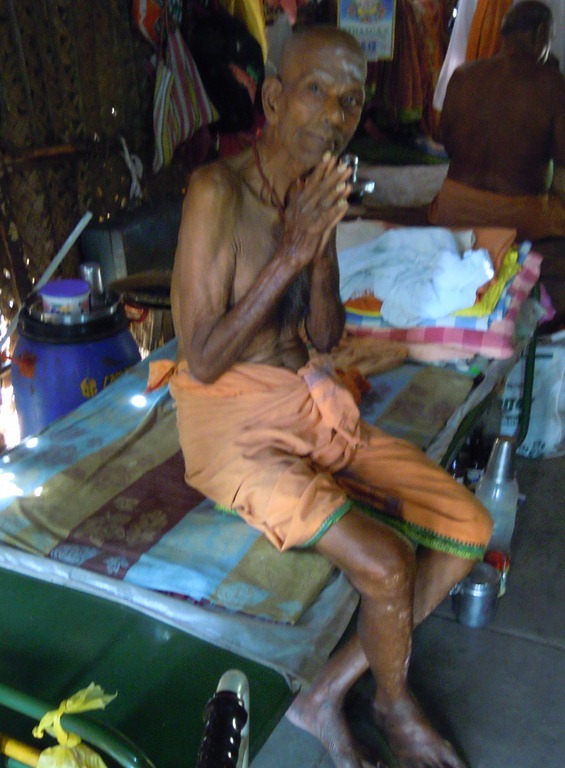 This is a way that you can show your love for Arunachala, by supporting these sadhus who live in His hands. 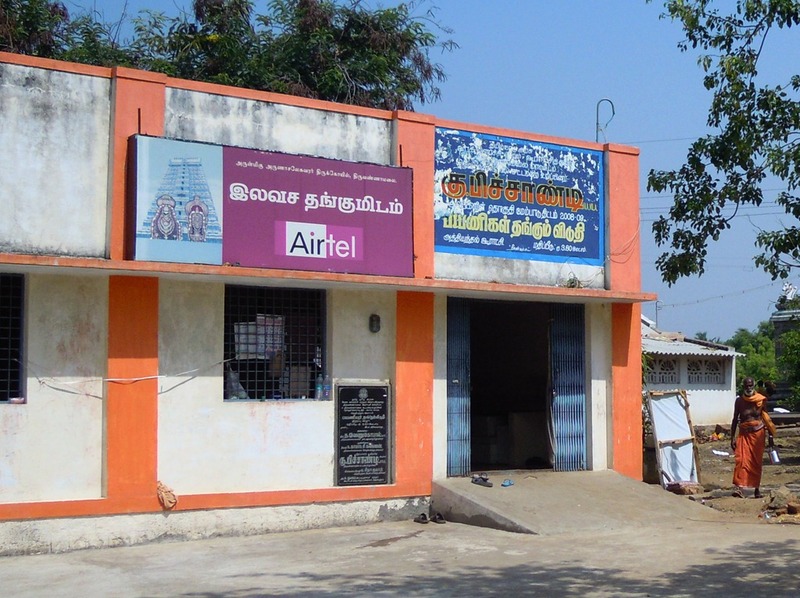 Dear Sir, I will be coming to visit Thiruvanaamalai on 6 Feb 2016 and would like to take this opportunity to buy a good lunch for sadhu who are living along the Girivalam. Please advice me how I can go about doing this. Thank you.